We know, in aggregate at least, multinational corporations hired offshore while firing in the United States. We also know outsourcing is not good for America on a macro economic scale. We also know there has been no job growth since 1990 in any occupational category that can be offshore outsourced. So, instead of austerity versus spending, how about some large economic structural changes? For example, we know the China trade deficit has a lot to do with their currency manipulation. We know NAFTA style trade agreements have cost millions of jobs. We know that multinational corporations move jobs, plants, manufacturing offshore. Why not address the real problems instead of this never ending banter which does not? After all, it's only America on the line at this point. It's all well and good to propose WPA, and copy the New Deal era CCC. Considering the 25.2% unemployment rate for teens, a CCC sounds like an outstanding idea. Yet when there are 8 million illegal workers taking jobs that could be done by America's teens, and Democrats refuse to enact and enforce requirements of U.S. citizenship, for Stimulus jobs, what's the point? Yet another jobs program for Mexico's worker overflow? First, in February, ABC News reported that almost every Americana-themed trinket sold in the Smithsonian Institute is made in China. Then news hit that San Francisco is importing its new Bay Bridge from China. Then came the New York Times dispatch about the Big Apple awarding Chinese state-subsidized firms huge taxpayer-funded contracts to "renovate the subway system, refurbish the Alexander Hamilton Bridge over the Harlem River and build a new Metro-North train platform near Yankee Stadium." Astounding as all of that is, it was quickly topped by news last week reminding us that the new Martin Luther King monument in Washington was designed by a Chinese government sculptor and assembled by low-wage Chinese workers. Further, since consumers are 70% of GDP, all eyes look to the U.S. middle class as consumers, even when talking about income inequality. That's a fundamental problem. There needs to be a shift to look at America's middle class as producers, not just some hapless group of credit card crazed shoppers. How about a recall of all CEOs who ship jobs offshore? The AAM has a great idea. Why not at least kick these Benedict Arnolds out of the White House. How about a domestic tax on any corporation who offshore outsourced and a tax credit for any business who brings back jobs which were offshore outsourced previously? After all, that is the original point of the corporate tax code, to use incentives to generate economic good behavior in the national interest, not to enable more tax havens and double dutch loopholes. Ever hear these ideas presented by D.C. political leadership? Of course not, their corporate donors won't let them. Projected effects of stimulus are represented as GDP multipliers. One needs a multiplier greater than 1 for that act to be effective in comparison to doing nothing. A multiplier is how much more economic output will occur for every $1 of additional spending. The Buy American requirement is estimated to increase jobs in U.S. manufacturing by 33%. Just a 1% increase by Americans to buy goods made in America results in 200,000 new jobs. Of the CBO multiplier estimates, the two strongest are government purchases and infrastructure spending. That said, government purchase, infrastructure GDP multipliers have wide variance, from 1 to 2.5. May we suggest it is only by buy American, or domestically produced goods, that one can get an economic output multiplier on the higher side. One might notice the insanity of Democrats versus Republicans on hiring U.S. citizens, preferred, and permanent residents. Democrats rail against offshore outsourcing, while the 2009 Stimulus was littered with loopholes to ship jobs overseas. Republicans decry illegal workers, all the way enabling more foreign guest workers in order to fire Americans and take their jobs. Literally Obama is trying to import foreigner workers to displace American professional and technical workers, all under the guise of a manufacturing program. Global labor arbitrage is worker displacement, whether that replacement worker is sitting in Wyoming or Bangalore India is unskilled labor or skilled. Bottom line, a labor market is supposed to be a domestic labor market and Americans need those jobs. Does it make sense to use America's taxpayer money, money straight from their pockets, to create jobs.....for peoples of other nations? In terms of economic stimulus and multipliers, with an official 9.1% unemployment rate, and some estimates of over 29 million Americans out of work, desperate for a job, no, it does not. Mandatory Hire America and Buy American requiements will be attacked from special interest groups with a vengeance. The U.S. Chamber of Commerce, per their offshore outsourcing multinational corporate agenda, with scream that's protectionist. The left will declare, that's racist, to not create jobs for undocumented immigrants. The right will shout that's anti-business, for curtailing offshore outsourcing and the so called cheaper supply chain. At this point, can America afford more policy that doesn't add up, doesn't make any economic sense that even someone with a 2nd grade education can figure out? America cannot afford some things, it's true, and the number one thing the United States cannot afford is our corrupt political system landscape and unbelievable lies on what does what to the U.S. economy. We simply must end economic creationism, lobbyist white paper spin and policy agendas declared to do the opposite of their real intent. We need mandatory hire America and buy American in any bill. We all should look in the mirror. Consumer spending is 70% of our entire economy, and most of our economic suicide takes place at the cash register. We vote with our dollars. Every time we make a purchase, we vote for "Made in USA" -- or we vote for something else, like the People's Liberation Army. Put a pencil to it. If everyone in the U.S. simply reallocated one dollar per day, from foreign-made to U.S.-made, we'd create a lot of jobs. Ten dollars or more per day and our troubles could be over. and they discovered that infamous "it's cheaper" if made from China didn't hold water. They retrofitted entire homes with made in America products, swapping out the Chinese, overseas counterparts and found they could get American made products for the same amounts. So, much of this has to do with capital investments in EEs, all for Wall Street, once again and "investors". Also, labor costs are maybe 20% maximum in advanced manufacturing, it's really plant, processes that are costly. So, the never ending claim U.S. workers must cut their wages to slave wages in order to compete is another lie. It's not true, just yet another excuse to wealth transfer from workers to the uber-rich. But this post is purely about government spending and actions as economic stimulus. There, it really is a waste of taxpayer dollars for to get those high multipliers the money must re-circulate within that domestic economy as much as possible. Be nice if an additional condition would be anyone directly or indirectly receiving stimulus funds benefit be required to only spending, consume, products made in the United States with that corresponding disposable personal income received. if not cheaper labor why china? "...infamous "it's cheaper" if made from China didn't hold water." Then what is the motivation to manufacture in China if it can be made at the same cost in the US and not have to pay transportation cost of ship the product from China to the US? Is Apple manufacturing in China just because of EE (whatever that is - Wall Street something). Does retrofit house mean capital or consumer goods. Did they walk down the aisle of WalMart and compare the cost of weekly goods bought by a typical family make in China vs. US? If there is a You Tube of the ABC report I would love to see it - Friday Night Movie would be great. I think a lot of the moves to China have to do with capital, financialization and also the mythical 1.4 billion consumer market. I also think, these days, "sales" in terms of promoting manufacturing in China is better than finding competent manufacturing in the U.S. It exists but in terms of potential customers finding it, it's harder. I'm thinking of the smaller scale niche products. I'm going to dig into the details on this and write something up. On ABC news, I already did a FMN, link is here. Very good series and I noticed ABC is much more willing to report economic stories from working America's viewpoint. If you click on that video link at the top here, all of them are in order. I guess I need to give some better site organization so by topic they can be more easily found. That's the point of FMN, to easily find documentaries, videos on economic related topics. I think a lot of it comes down to that China has a unified, integrated pro-China-manufacturing mercantilist policy that is very aggressive and very successful. It's part of their regular Five Year Plan, and they take it seriously. Anybody remember about 10 years back when China cornered the leather market globally in order to accomplish mercantilist (monopolistic) objectives? That's the tip of the iceberg! 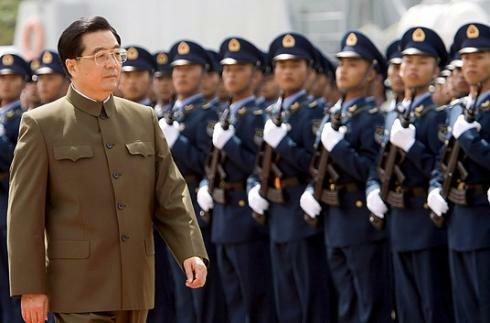 China manages economic war just like it prosecutes any other kind of war -- by the rules of Sun Tzu's Art of Warfare. "Shanghai wasn't built in a day." Chinese planners waited patiently for the arrival in secret of the first nibble from Henry Kissinger in 1970, gracefully accepted Kissinger's acquiescence to their demand to take China's permanent seat on the United Nations Security Council in 1971, enthusiastically welcomed the historic visit of Richard Nixon in 1972, welcomed the real deal when George H. W. Bush came to Beijing in 1974 as President Ford's 'Chief of USA liaison office to the People's Republic of China' (before diplomatic recognition of China by USA), gracefully accepted the USA's bowing to reality when switching diplomatic recognition from Taiwan to Beijing in 1979 ... introduced post-Mao reforms under Long March veteran and political genius, Deng Xiaoping, throughout the 1980s ... made limits to reform perfectly clear at Tiananmen Square in 1989 ... took note of the coming era of corporate globalization and acted accordingly, especially through Hong Kong, to continue to improve standard of living for millions of Chinese ... received 'Most Favored Nation' status under the United States-China Act of 1993 ... absorbed Hong Kong in 1997 ... continued to take note of the coming era of corporate globalization, acting accordingly ... set loose the forces of competition within a system of state capitalism ... joined the WTO in 1997 ... lobbied the U.S. Congress for the China Trade Act which was enacted in 1999 ... infiltrated the WTO and the U.S. Congress ... hired the best math-type business analysts ever, sent their best and brightest to study economics at Harvard and Cornell and MIT ... and they have accomplished what they set out to do. I hope this doesn't seem critical of China. I am just being descriptive. Frankly, I admire China. China is very strong, truly a worthy adversary. We aren't the only nation that is chafing under the Chinese yoke! Just a week or two back, Kyrgyzistan stopped the export of slurry and ore in order to prevent China's taking bullion production jobs and profits away from them. This move was years in the making, involving the remarkable existence (almost side-by-side) of both a USA and a Russian airbase in northern Kyrgyzistan. It ain't easy to demand your rights when dealing with the People's Republic of China, (which shares a long border with Kyrgyzistan), but the first step (for USA) is to make certain that no member of Congress dare oppose (as did every GOP member of Congress in 2010) disclosure of political contributions from foreign corporations (= governments, in a mercantilist system). I hate to introduce politics into an EP economics blog. But, dammit, this is fundamental to all the China issues, and no one dares address it! If you want to oppose anti-American effects of the mercantilist policy of the People's Republic of China, you have to oppose current congressional Republicans. Going deeper, you have no choice but to dedicate yourself to the decline and fall of the Republican National Committee as it currently exists. It's as simple as that. Observers say it all came down to one simple thing: opposition from the Republican National Committee! Threats to withdraw campaign money and media support! And not one patriot out of the whole dang bunch of them! See, CitzenVox.org's "Partisan Politics At Its Worst"
And, if you can't stomach Obama and the Democrats, it's past time to join and support ANY political party other than either of the two major parties. I mean, if you find yourself between a rock and a hard place, isn't that time to move yourself? OTHERWISE, if you want to cling to your delusions about the GOP -- with the notable and praiseworthy exception of Buddy Roemer -- go ahead ... make Hu's day! But PUH-LEEZE stop your smiley-faced idiocy of "let's all just buy American" and your belly-aching about the yuan's peg-to-the-dollar! You may have a different point of view, of course. You may think that we should just monkey-do China, or at least Singapore. Many Republicans openly advocate such fundamentally anti-American policies. The problem is that our democratic (small d) and republican (small r) traditions are fundamentally opposed to a mercantilist monopolistic type of government (Communist corporatism). Republicans and some Democrats talk up Singapore as the 21st Century utopian model, but most Americans (I hope) are not interested. America is the land of competition -- of free enterprise where the ideal is a transparent and stable tax and anti-trust environment that fosters success of efficient small businesses free of all preference systems. (2) What Robert Oak has proposed, namely, renegotiating all all FTAs along realistic lines, including VATs at our borders. Yes, but all tax legislation begins in the United States House of Representatives! We all should send make-up mirrors (made in China) to every member of Congress who fails to act for a real tax revolt! These tax favors [IRC provisions such as mortgage interest deduction] tend to be skewed up the income ladder. Less than half of homeowners, for example, make enough to get any savings from deducting mortgage interest. The share of people benefiting from tax breaks for retirement plans and healthcare rises with income, an upside subsidy system for the affluent. ... The total [cost in 2007 of a few tax favors] came to $950 billion. If we dumped all the tax favors, all else being equal, we could make one of three choices. We could cut tax rates across the board. We could bring in enough money to make the perennial federal budget deficits the kind of minor concern they were before the Reagan era. Or we could exempt at least 72 percent of American workers from paying income tax, as China did until this month. Imagine the talk in Washington if, as in China now, 92.3 percent of American workers were exempt from income tax. Imagine also how much simpler and pleasant life would be if, as with China today and America long ago, we had an income tax so simple you need not file a return unless you were highly paid and, even then, could file a return in a couple of minutes. Then again, the Chinese "leaders might [come to] model themselves after American politicians, who hand out ever more tax favors and then decry complexity and the tax rates required to make up for those favors. @Bob Hall said "Consumer spending is 70% of our entire economy"
Ahh, but the top 5% account for 37% of that outlay (see link), maybe the top 20% most of the rest. Hence you can easily see it is reasonable to allow 80% of the population to live in tent camps in the desert. 50 of the country makes $26k or less, but still, I'd have to realty check that number. The uber-rich have a tendency to save, invest, not spend proportionate to income inequality. i.e. they get another $10k they spend another $10k doesn't work like that. Middle class, poor on the other hand, spend it immediately, mainly because they are so broke, they are immediately spending money to buy food, gas, needs. WTO 'Uruguay Round' -- "Agreement on Government Procurement ('GPA')"
USA has been bound by this agreement since it entered into force 1 January 1996. 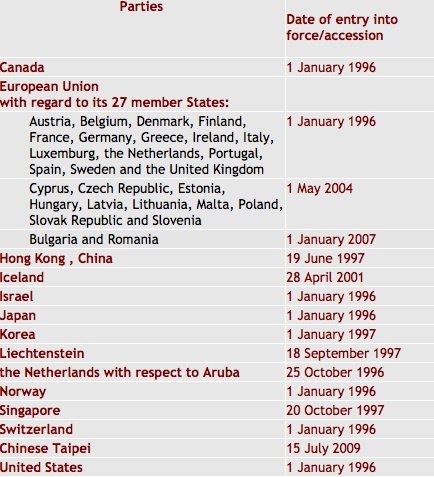 China (including Hong Kong) have been parties to the agreement since 19 June 1997. "Most Parties have been bound by the Agreement since its entry into force on 1 January 1996. For some, it entered into force at a later date. Some Parties have joined the Agreement by way of accession." (b) that its entities shall not discriminate against locally-established suppliers on the basis of the country of production of the good or service being supplied, provided that the country of production is a Party to the Agreement in accordance with the provisions of Article IV. 3. The provisions of paragraphs 1 and 2 shall not apply to customs duties and charges of any kind imposed on or in connection with importation, the method of levying such duties and charges, other import regulations and formalities, and measures affecting trade in services other than laws, regulations, procedures and practices regarding government procurement covered by this Agreement [i.e., when such customs duties and charges are general, not particular to government procurement]. In the process of qualifying suppliers, entities shall not discriminate among suppliers of other Parties or between domestic suppliers and suppliers of other Parties. It's not true when doing a temporary, government run one time issue. Also, employment by citizenship status is not under this agreement, as are a host of other procurement procedures. Seriously, you're pulling a GOP talking point. Case in point, Canada is on the list and you should see all of the "Buy Canada" programs they have into place. Employment, by citizenship status has NEVER been part of any agreement, including WTO GATS mode 4. India BPO industry is trying, but it is not. Sponsored by the US Chamber of Commerce to echo through various Politician puppet mouths. They ran that on the 1st stimulus in order to weaken and loophole the buy American clause. Also, other nations who think America is their toilet, i.e. their consumer market lobbied heavily. Thank you for pointing out that the Chamber and their political puppets make WTO objections to jobs legislation without also demanding withdrawal from the WTO! And they do so even while supporting enactment of Panama, Korea and Columbia FTAs! The question today is whether Republican populists will join with progressive Democrats in sufficient number to defeat the FTAs this year, or not. Sometimes I forget just how hypocritical the professional GOP (RNC) and their Dempublican allies (current DNC) can be. They have been a$$inine hypocrites on trade since Dole's vote for NAFTA. Of course, 'neo-con' intellectuals have always advocated against protectionism, but at the grass roots level, Republican 'conservatives' and Democrat 'moderates' have never come square with the people, and they have been trying to cover their sorry arses about that since they were called out by Perot in 1996. Like an unpopular emperor, the GOP elephant parades in a new suit of clothes every other year ... but even a child can see the dirty behind for what it is. While 'moderate' Democrats continue to cower in the shadows, 'conservative' Republicans, at least, maybe are becoming more honest about their anti-American politics. If we take them at their word, Republican leaders in Congress today have elevated their 'right' to be corrupted by foreign lobbyists to the level of a principle. Give me a break! I am citing the agreement itself not to run down stimulus or Keynesian economic policy but to run down the fiction that we are in any way bound by WTO 'law'. END THE HYPOCRISY ABOUT THE WTO! WTO IS A PAPER TIGER! What are you saying? -- that because nobody follows this 'law' therefore we should be afraid to challenge it in the sands surrounding its foundation? Am I guilty by association of the political posturing of any and all who have ever cited the text of a WTO agreement? The institution of slavery was once defended by quoting from the King James Version, but that did not give Henry Clay a copyright on the Holy Bible! Your disagreement is with the letter of the GPA or with the WTO, not with me! I have cited nothing but the agreement itself. Okay? Your approach is two-pronged -- "Hire American" and "Buy American". But aren't you asking USA to fight in the marketplace with one arm tied? True, the WTO famously "allows" us our migration barriers but the WTO also promotes global labor arbitrage. Apologists for the system of unrestrained flow of global capital have long decried the lack of provisions for 'free' flow of labor in the WTO system as the primary failure of that system -- and something that will eventually be 'fixed' in pursuit of the destruction of labor standards. Meanwhile, it appears that the "Buy American" side is where the best bang for the buck can be found. On the "Hire American" side, of course, if the stimulus were all government employment, that would be proof against any attack under color of the WTO's GSA. Unfortunately, by the letter of the GSA (use of the catch-all term "entities" and consistent language including "services" as well as "products"), any attempt to contract out stimulus employment with a "Buy American" provision, even to non-profits, would be contrary to commitments made on our behalf in 1995 -- unless we would allow foreign-owned entities to participate equally in bidding on the projects involved (e.g., training). Indeed, foreign-owned entities might even claim 'anti-discrimination' preferences of some kind! If some of the stimulus would be going to Nissan USA at USA facilities, for example, that would be fine ... but we must be ever vigilant in these stimulus packages not to open up opportunities for scammers. At least, any scammers should be entities with a real stake in the USA economy -- not foreign-based raiders! My point is that all this should be decided by the Congress without reference to WTO 'law' -- and my position is the opposite, I think, of the smiley-face idiocy of so-called 'free traders' among the congressional GOP. Of course, none of these commitments have been authorized by treaty, but that hardly makes them beyond criticism -- particularly since Federal courts may enforce them. I do appreciate your points about possible exceptions allowed in WTO 'law', although I am uncomfortable with WTO quasi-judicial forums deciding those exceptions in secret sessions on an arbitrary basis, as they do. No, I'm saying the GSA knows about the Buy American Act, which already exists, so claiming one cannot enact a Buy America condition in another Stimulus isn't true. there isn't a conflict. I don't mean you are GOP of U.S. Chamber of Commerce, I'm implying the defeatism that a Stimulus cannot be architected to be completely focused into the domestic economy and it's citizenry, even with the pathetic excuse of trade agreements, isn't valid. That said, I recall the Obama administration issuing waiver after waiver, which beyond the fact that $200 of the $787 B was useless tax cuts, another $100 B for AMT, and I don't recall the percentage for UI expansion, but very little was left for any sort of direct jobs, or the type of directed investment + jobs sort of thing needed. On top of that, money just poured out of the United States and the point of this post is beyond the housing/residential real estate/construction collapse, America has been hemorrhaging jobs for over a decade. but in the meantime there are ways to legislate some strong Buy American into a Stimulus. I doubt that fundamental conflict between USA (or global) economic recovery and the WTO system can be forestalled much longer. There may be nothing said in the GPA about citizenship as a requirement for a government training program, but does that assure that the WTO would not find an implied or embedded visa right for the training and administrative staff -- not to mention electronic outsourcing? Often, the best jobs in stimulus programs are the training and administrative positions. Free trade agreements (called FTAs) such as NAFTA (North American Free Trade Agreement) receive a lot of public discussion because of the immense effect they have on our economy, but very few people understand that these agreements are about much more than trade and the exporting of jobs. Global trade agreements come with the extra baggage sometimes referred to as "embedded visas." FTAs contain embedded visas because immigration is often used as a bargaining chip during trade negotiations. Pressure for visas comes from multi-national corporations seeking to import cheap labor, from special interests that want access to foreign markets, and from pro-immigration groups who have a variety of agendas. Supposedly $100 billion for the "payroll" tax cut, which is employee side and reduces FICA, which are payments into SS. I've seen multiplier claiming this helps, but frankly it's by me when the issue is jobs, plus social security is under direct attack....so gee, let's underfund it. It's only an indirect employer cost reduction but that's if they reduce wages. lovely. I'll try to go through some of these but we need GDP multipliers that hit 2.5, not ~1.2 here, esp. with all of America poed at "spending". and write it up. Intuitively, as a "stimulus", I think this "tax cut" makes little sense. The issue is jobs, job creation, job hiring, in the United States and we've seen correlation after correlation that tax cuts do not create jobs. Esp. tax cuts to the employee side. It might give a little extra to boost consumer spending, but that's not the #1 issue here. Also, Okey mentioned FTA foreign guest worker Visas. It's true they are part of some of the trade agreements, but that's just the type and availability. There is no requirement that foreign workers are imported as part of a trade agreement. So, in other words, the idea of putting immigration status conditions on any jobs generated in a Stimulus should be free and clear of any trade agreement complications. It would be all corporate lobbyists and their agendas. Right now, we have corporate lobbyist "article plants" daily, in the financial press, trying to claim worker displacement, especially in the skilled areas, helps the economy. It does not. When you have all sorts of talent with U.S. citizenship going broke, unable to find work to apply their craft, that is not good for the U.S. economy and that is the situation. It's so bad, NCG (new college grads) are going on TV and organizing to try to fight for at least funding to start a business. Why? Because VC funds are rare and they cannot get that entry level job either. Add to that we have in masse, age discrimination, so they are laying to waste all sorts of talent simply because they are over the age of 35 and 50 is a wasteland, simply due to their age. agreement. While Mexico has gotten most of the attention,relatively little attention has been paid to the migration of manufacturing and high-value-added service jobs to - Canada. TARIFFS on a broad range of goods, with special tariff and other penalties applied retroactively to those manufacturers who have specifically moved their manufacture of goods intended for US domestic consumption overseas. If we are going to have "Free Trade" it must be only with those nations with comparable levels of wages and social development who also allow us access to their home markets on the basis of fair and equal competition. This is essential to exclude Japan, which although a high-wage, high-development nation, is even more mercantilist and protectionist than China. This would still give us free trade with Canada, Australia, New Zealand, the UK, and many of the EU nations. As they progress, other nations can gradually be added - perhaps Russia, Korea, even Brazil and Chile. That's plenty. The rest of our needs - we can make ourselves. Factories move to Canada because Canada has a successful 'socialist' medical insurance program. The USA needs to get away from employment-based medical insurance, if we want to become competitive in international markets. The employment-based system is inefficient anyway in today's economy. Time for a reality check. Obama's quasi-solution, while arguably an improvement, was basically a failure from the start because it failed to reach basic structural problems. It's true, as Ross Perot pointed out, that "free trade" agreements require nations with comparable levels of social development ... and that's why Canada might at this point have second thoughts about getting into bed again with the USA. There's also the matter of resources. Big question there about how those would be handled in any new NAFTA. Heck, there's a big problem about how those are handled in the existing NAFTA. ... where you are forced to debate the thieves, and their cohorts all the way down the feeding-chain, and the preceding, thief, benefactors, and useful-idiots alike, are heavily funded by the crime-lords and their lobbies, via the ‘take’. MNCs' [/media/and academia] are not [supposed to be] in charge of U.S. immigration. Visas such as H-1b, should be immediately suspended. MILLIONS of our better paying jobs would be instantly RETURNED, to Americans, in America. HOW can anyone speak of returning jobs to Americans, while they ignore, or worse, lobby for, the CONTINUED replacement of MILLIONS of Americans, in American offices and worksites, with foreign nationals? MUMBAI: US diplomat Peter Haas, recently appointed consul-general in Mumbai, stressed the importance of people-to-people contact in Indo-US ties. US-India people-to-people connections are more powerful than any government initiative, said Haas. "While 8 lakh Americans travel to India each year, the US issues half a million non-immigration visas to Indians yearly," he said adding that Indian citizens formed the largest group of people to be issued H1B and L visas by the US over the last year. The J-1 student work-travel program was created in 1961 to offer work opportunities and cultural enrichment for foreign students, and in the process, create goodwill ambassadors for the United States. But the kids aren’t working in professional settings that complement their studies. They’re toiling in warehouses for huge companies such as Hershey’s, which have laid off hundreds of workers, and resorts, from Disney World to Morey’s Pier in Wildwood, and for much lower wages than Americans earned doing the same tasks. It’s a great deal for U.S. companies, because they don’t have to pay payroll taxes, Social Security or health insurance for J-1s. One Spring Lake staffing company even has a nifty calculator to help businesses compare the costs of hiring J-1 vs. American workers. We should also revoke some or all green-cards, RETURNING a MASSIVE number of jobs, for Americans, in America. And then there is the issue of sending our jobs offshore, often implemented by those brought to our country on visa, or those having become a green-card holder, who then coordinate the shipping of entire departments, knowledge-bases, and ultimately, entire industries, out of our country. And what of, low to medium wage jobs? We can look towards our wide-open borders, and consider the traitors that advocate a nation without enforcement of its own borders, its laws, and disinterest in its own sovereign best-interest, survival. And yes, it is Americans who have facilitated this betrayal of Americans, by corporations, supported by a sold-out government and press.